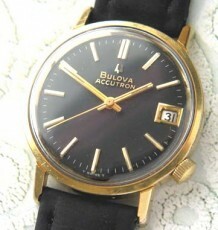 Iconic Bulova Accutron, vintage electronic divers watch. Fantastic bronze dial with orange accented rotating bezel. 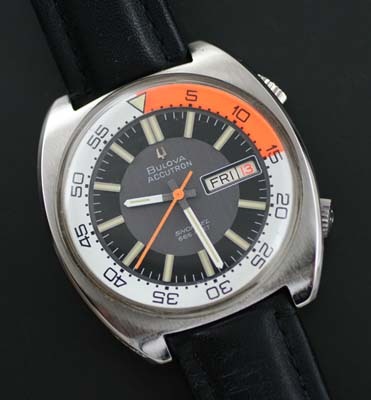 A truly spectacular vintage Bulova Divers Accutron watch. With the re-edition of the 50th Anniversary Accutron, may collectors are looking at these pieces of American history with renewed interest. 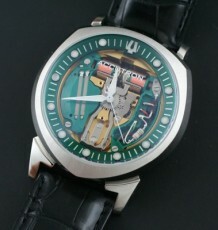 This Sports Accutron Snorkel divers watch is unusual as it has the same configuration and case as the Accutron Deep Sea. 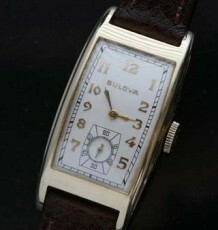 The dial is surrounded by a very bright and remarkable white and orange rotating bezel, located under the crystal. The hands and dial are in excellent condition. 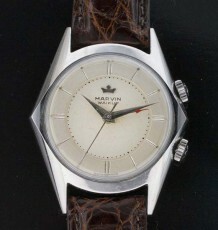 Both crowns on this watch feature the correct Accutron signed units. The watch runs and keeps excelelnt time as it was just serviced. As clean a sports Accutron as you are likely to find. The heavy stainless steel case measures 41 mm wide by 45 mm long and is supplied on a choice of black or brown leather straps.